48. The Letters of W. B. Yeats. Edited by Allan Wade. London: Hart-Davis, 1954. In addition to letters noted, others include details of Yeats’s relation with Pound, Binyon, and Craig (see D17), references to Itô (Ap), and discussion of the writing, planning, and production of Yeats’s plays indebted to his understanding of the nô, particularly the first performance of At the Hawk’s Well (12; see index). a. To Fiona Macleod, January 1897?. Even at this early date Yeats’s conceptions of drama reveal interest in much for which he later found sanction in the nô: ‘My own theory of poetical or legendary drama is that it should have no realistic, or elaborate, but only a symbolic and decorative setting. A forest, for instance, should be represented by a forest pattern. And not by a forest painting. One should design a scene which would be an accompaniment not a reflection of the text. . . . The acting should have an equivalent distance to that of the play from common realities. The plays might be almost, in some cases, modern mystery plays’. b. To the editor, Daily Chronicle, 27 January 1899. Anticipates by seventeen years Yeats’s introduction to Certain Noble Plays of Japan (11) and its call for an aristocratic audience and a drama with ‘no need of mob or Press to pay its way’: the need, Yeats contends here, is for ‘a theatre which is part of the intellectual life’, but this is not possible until drama ‘escapes from that general public whose slave it has become’, for ‘the general public . . . will always hate literature and the arts because it will always shrink away from the laborious or exhausting ecstasy in which literature and the arts are understood’. The theatre may only ‘escape’ by ‘working for’ that ‘small public which cares for literature and the arts’. c. To Lady Gregory, 24 November 1904. Includes the earliest example in the published record of Yeats connecting the arts of Japan with his own dramatic work (see also 7). Lady Gregory’s son, Robert, has designed a ‘wing’ for plays soon to be presented at the Abbey Theatre, and while Yeats finds It ‘very good for a remoter play’, it is ‘too far from realism to go with comedy or with any ordinary play’. Yeats is ‘very glad to have it’, but has ‘found out’ that the ‘exact thing’ he wants is ‘the sort of tree one finds in Japanese prints’, and so ‘if Robert could find time to look up some prints and to make . . . a wing of this sort in the next three or four days’, Yeats would ‘be very glad’. The plays upcoming at the Abbey were Lady Gregory’s Spreading the News and Yeats’s own On Baile’s Strand, the first of what would become a cycle about the life and death of Cuchulain (see 12, 14b, 35a, 44a, 168, and 227). d. To John Butler Yeats, 14 March 1916. Yeats has been ‘turning over a book of Japanese paintings’ and remarks of their ‘delight in form’ and ‘ordering of natural objects’ without resort to ‘imitation’; ‘one feels’, he writes, that the artists have ‘had to consciously and deliberately arrange’ their subjects (emphasis Yeats’s). f. To Lady Gregory, 8 September 1917. From this date at the latest until at least his letter to Edmund Dulac in October 1923 (m below) Yeats refers to the drama he is writing as his ‘Noh’, here in reference to The Dreaming of the Bones (14a). See also letters to Lady Gregory of 4 and 12 January 1918 in this volume, 47a, 48g, h, and l below, and 57c. g. To Quinn, 8 Feb 1918. Wade does not include an editorial note about Yeats’s comment that he has ‘written four plays in the style of the “Noh”’ and has a ‘plan for a fifth’, but those Yeats had in mind would have included At the Hawk’s Well (12), The Only Jealousy of Emer (14b), The Dreaming of the Bones (14a), and presumably The Cat and the Moon (24a). The planned fifth work would be either CALVARY (17a) or a never-completed play mentioned in a letter to Lady Gregory of the previous 14 January (see p. 645). h. To Quinn, 23 July 1918. 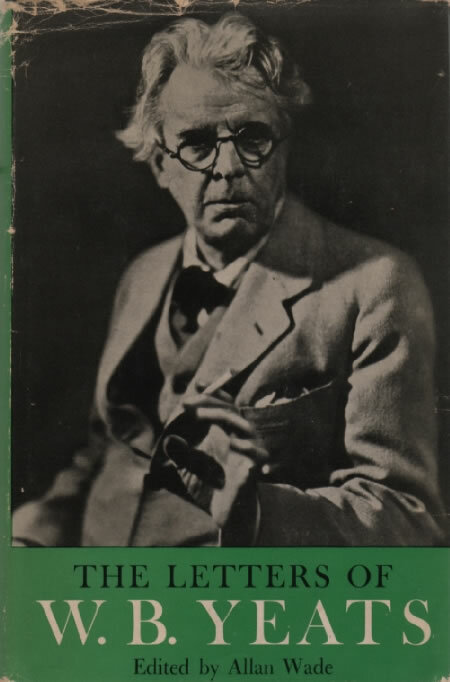 Yeats writes that he has ‘finished another “Noh” play’, presumably Calvary (17a), and laments Itô’s production of At the Hawk’s Well in New York, for Yeats ‘meant these “Noh” plays never to be performed in a theatre’, and ‘had thought to escape the press, and people digesting their dinners, and to write for [his] friends’, a point he had made in more formal language two years earlier in introduction to Certain Noble Plays of Japan (11). i. To Quinn, 11 July 1919. Yeats writes of a recent invitation ‘to lecture for two years in Japan at a university there’ (Keio, see 124a1), but he has not had time to decide whether to accept. Clearly, however, he has given the matter thought: ‘It would be pleasant to go away until the tumult of the [Irish civil] war had died down. . . . But would one ever come back?—would one find some grass-grown city, scarce inhabited since the tenth century, where one seemed surpassing rich on a few hundred a year?’ The letter continues weighing the decision, but ultimately offers better reasons for staying in Ireland than for going to Japan, though see j below and 56. A decade later Yeats received a second offer of a Japanese professorship, which he was ‘tempted’ to accept, but persuaded by his wife did not (see s-t below, 52e-f, and 124a2). See also k below and 63.
j. To A. H. Bullen, 15 November 1919. Four months after his letter to Quinn about the invitation to Japan (i) Yeats continues to take the offer seriously, though now considers staying for a shorter time: ‘I go to America on Jan 6 and may after lecturing go on to Japan where I have been offered some lectures at Tokyo University and be away a little over a year’. The original offer in fact was not from Tokyo University, but from Keio University in Tokyo (see 124a1). A rather wonderful thing happened the day before yesterday. A very distinguished looking Japanese came to see us. He had read my poetry when in Japan and had now just heard me lecture. He had something in his hand wrapped up in embroidered silk. He said it was a present for me. He untied the silk cord that bound it and brought out a sword which had been for 500 years in his family. It had been made 550 years ago and he showed me the maker’s name upon the hilt. I was greatly embarrassed at the thought of such a gift and went to fetch George, thinking that we might find some way of refusing it. When she came I said “But surely this ought always to remain in your family?” He answered “My family have many swords.” But later he brought back my embarrassment by speaking of having given me “his sword.” I had to accept it but I have written him a letter saying that I “put him under a vow” to write and tell me when his first child is born—he is not yet married—that I may leave the sword back to his family in my will. Yeats continues by noting that he has come to a decision about the offer from Japan (see i above): ‘We are not going to Japan. At least not for the present. The offer from there grew vaguer and the expense of living is immense. We should be bankrupt before we reached Tokyo’. l. To Lady Gregory, 10 April 1921. Yeats writes of recent difficulty finding ‘themes’ for his poetry and that he ‘may have to start another Noh play and get caught up into it’ if his new poems ‘turn out badly’. The poems, Thoughts Upon the Present State of the World (Dial, September 1921), did not turn out badly, and Yeats’s next ‘Noh play’, the first version of The Resurrection (28), did not appear until June 1927.
m. To Dulac, 14 October 1923. Among Yeats’s published letters this is the last in which he refers to his own drama as ‘Noh’. n. To Olivia Shakespear, 25 May 1926. Includes reference to the ‘silent’ transmission through the centuries of ‘the doctrine of the Zen school’. See also 47b. o. To Shakespear, 7 September 1927. Yeats closes by noting that he has ‘a mass of letters mainly to Japanese to write’. By this date he was corresponding with Oshima (see esepcially 124), Yano (see 76), Sangû Makoto (see 52), Sato (see 184), and probably Suzuki (see D28); he had known Noguchi as early as 1903 and had written to him at least once in the twenties (see D15b). p. To Shakespear, 2 (or 4) October 1927. Writing of a new poem, Sword and Tower, which according to Wade’s note became A Dialogue of Self and Soul (30a), Yeats says of Sato’s sword (see especially 21) and its silk covering that he makes it his ‘symbol of life’. q. To Shakespear, 2 March 1929. Includes passing reference to men in Japan, presumably poets, who would agree with Yeats’s idea that ‘the world’s last great poetic period is over’, even while ‘the young’ of Europe, including Pound, do not. r. To Shakespear, 29 March 1929. Remarking about the ease with which he is writing poetry, Yeats writes that he ‘feel[s] like one of those Japanese who in the middle ages retired from the world at 50 or so . . . to devote himself “to art and letters” which was considered sacred’. s. To Shakespear, 31 July 1929. Yeats writes of a second offer of a professorship in ‘Japan’ (see also i above), actually in Taiwan, then under Japanese occupation. He discusses details of the invitation—it is for one year, eight hours a week, £1000, and includes a residence and travelling expenses; he is ‘tempted’ to accept, in part because of a three-month summer holiday in Japan proper: ‘If my health is good enough it would be new life . . . wandering around Japanese temples among the hills—all the best Chinese art is in Japan. What an adventure for old age—probably some new impulse to put in verse’. The invitation would have been from Yano, then professor at Taihoku Imperial University in Taipei; Yeats had been in correspondence with him about a possible trip to Japan as early as January 1928 (see 52e-f). t. To Shakespear, 9 August 1929. A brief note saying that the Yeats family will not go to Japan (see s) because Yeats’s wife has been ‘quite firm’ that they should not; Yeats is ‘relieved and disappointed’. He wrote to Yano the same day turning down the invitation (see 52f). u. To Ethel Mannin, 9 October 1938?. In discussing his ‘private philosophy’ Yeats describes the treatment of death in the painting of several traditions, including ‘the Zen school of Japanese Buddhism’, the artists of which ‘have the idea of the concordance of achievement and death, and connect both with what they call “poverty.” To explain poverty they point to those paintings where they have suggested peace and loneliness by some single object or by a few strokes of the brush’. Yeats would have had in mind one or more of several passages in Suzuki’s Zen Buddhism and Its Influence on Japanese Culture, a work Suzuki had sent to him (see D28), in which both wabi (a sensation of loneliness or its cause) and sabi (an intermingling of beauty and sorrow or loneliness) are translated as ‘poverty’.